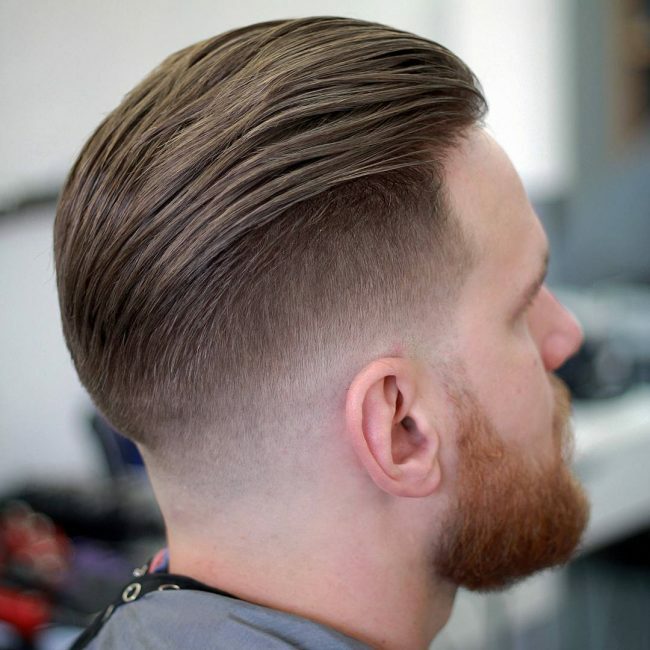 80 Powerful Comb Over Fade Hairstyles - (2019) Comb On Over! In this haircut the parting line is high, running at the same height as the crown. The hair has been rolled to curl over onto the right-hand side, reminiscent of the 50’s jelly roll style. The sides were graded shorter using slightly different settings on the clippers. In this look, the longest hair sits over the top of the head separated from the lower section by a gradual skin fade. The shorter hair is brown, but the locks on top have been colored a dark ashy blonde. This light colored hair has been brushed straight back from the forehead. 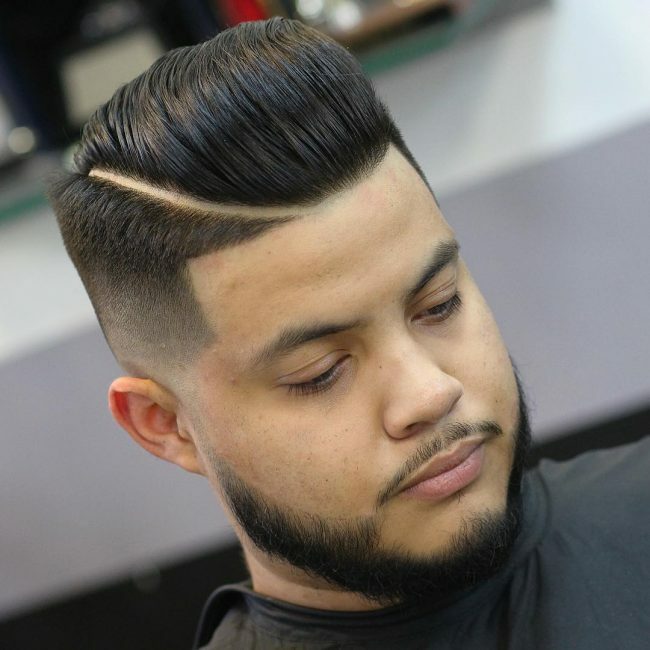 This hair has been separated by a long straight parting with the hair on the right remaining long and the hair on the left eased out into a skin fade. The long hair has a pushed up front portion adding height to the look. 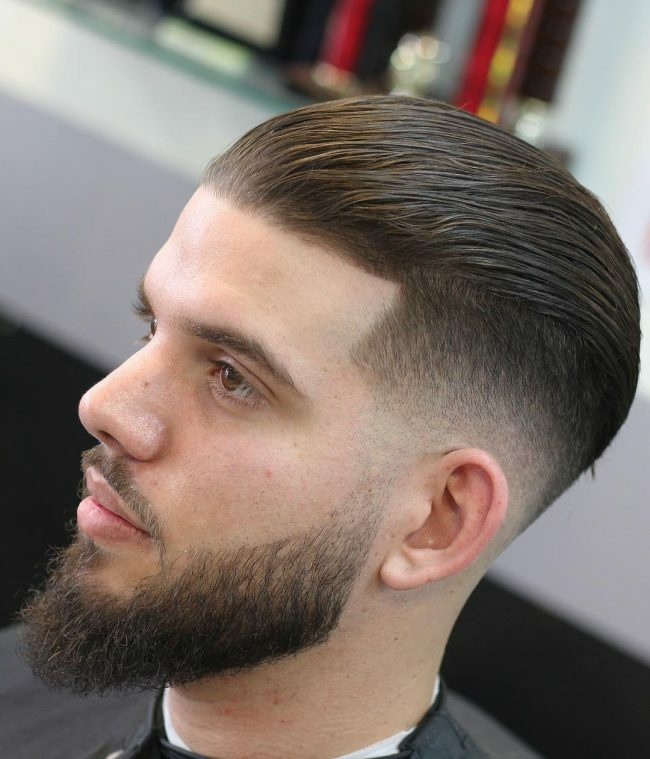 Styles with height are popular and this hairstyle with a straight up, combed over look in front and an expert skin fade on the side is an example of how to pull it off. 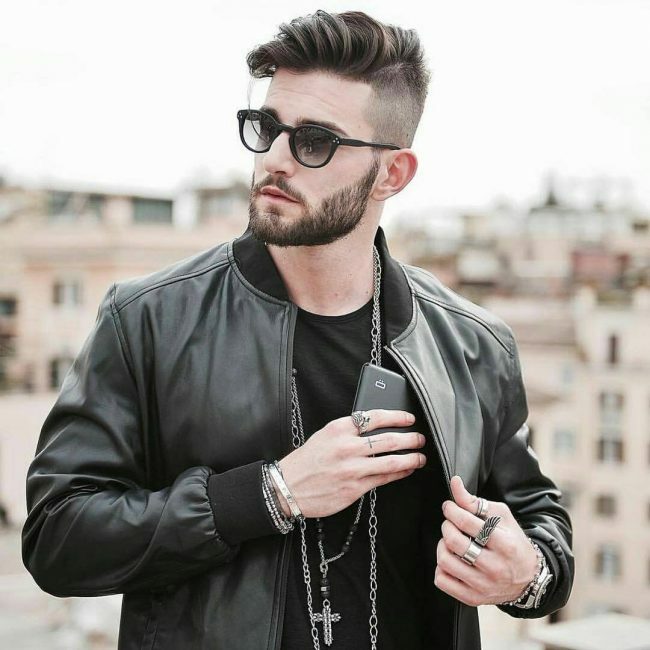 Team your dapper inspired hairstyle with a curly beard and retro shades and get ready to shine! What makes this razor fade so impressive is the way that the stylist has rounded it off so perfectly at the back. With the hair slicked like this, it is easy to admire the expert lines of this look. Visible partings are fine, but if you want a more subtle look, try combing your longer locks over to soften the line. Just pair with a skin fade around the edges and comb the hair through. 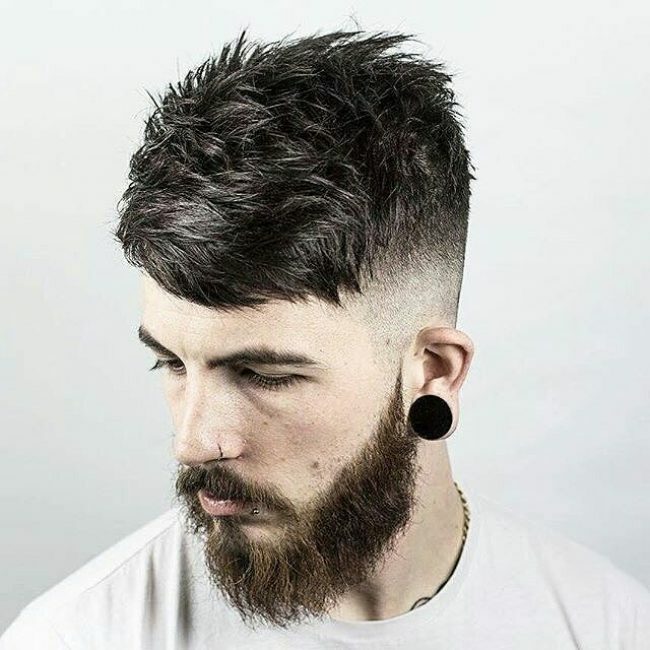 Instead of the parting dividing the long and the short hair, this short parting divides layers of longer locks while the skin fade occurs further down on the right-hand side. Add interest to your style by creating flowing lines around the face like this. Keep your look uncluttered and retain the length like this guy has done. He is sporting a high stubble length undercut while the locks on top have been combed back and reach to the nape of the neck. 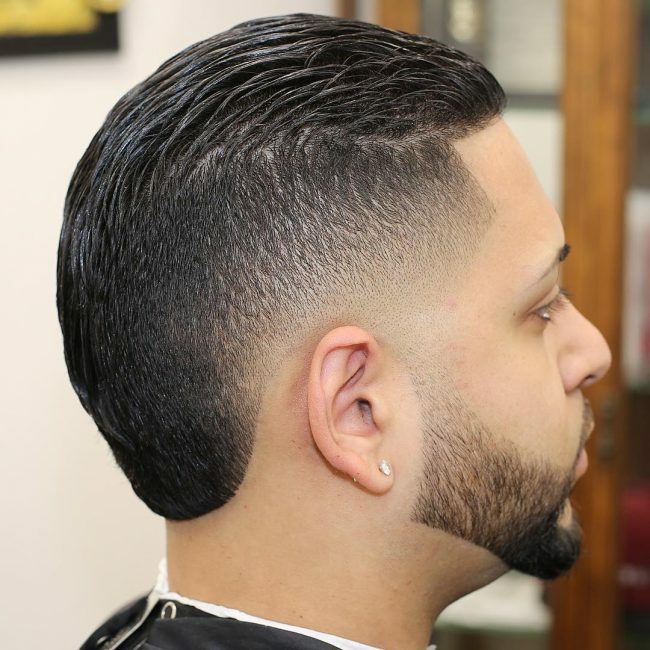 In this look, the fade begins tightly around the ears with the hair increasing gradually in length outwards. The middle portion of hair is the longest and has been brushed up for a super smart look. From this angle, we are able to see how the hair has been faded out along the sides. The hair is separated by a short parting and has the most length on the right. These locks have been combed straight back with a little lift over the front. Hard partings like this are created using a razor and look strong and masculine. On the one side we see a simple skin fade and on the other a neat quaff with lots of texture. Both come together to form a V-shape at the back. Wow! What a look! If you are ready for a high fashion street look try this one. The hair has a long parting high on the side with a two-step undercut underneath. The longer hair has been combed over and styled to curl high over and cover the undercut on the other side. Gentlemen love coiffed hairstyles like this that are sleek and ultra-neat. Copy this look by having a high undercut on the back and sides and then styling the remaining hair by blow-drying. Defined waves lend this look a formal feel, great for a special occasion. The upper hair has been styled with a blow-wave and a hot iron can be used to recreate this hairstyle. 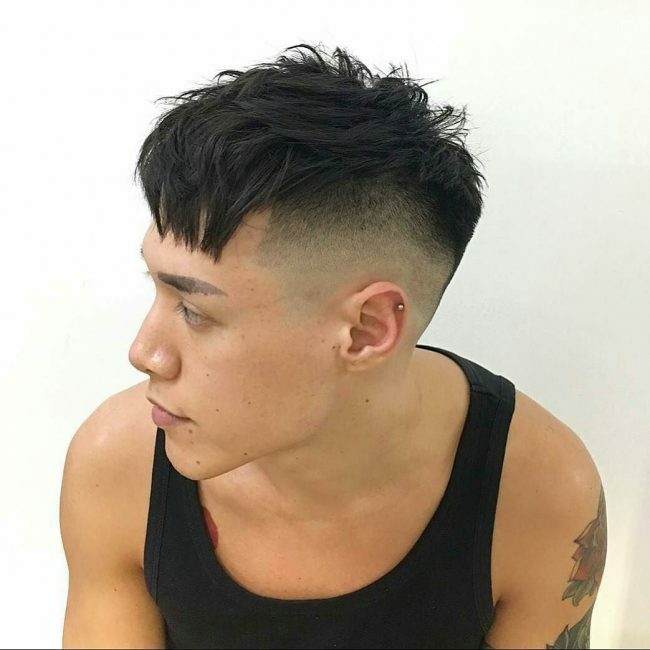 The sides sport a high undercut with a subtle fade. This top view gives an interesting insight into how this hairstyle was created. Starting from the left, we can see a hard parting that runs up to the crown and alongside it, longer locks have been combed into each other. The back and sides have been clipped short with a gradual fade out. Get an edgier look like this by asking your stylist to scissor cut your top locks. This will add texture and with a little product, you can easily style it as you see here. The skin fade here is understated and no partings are visible. Ready for the latest in street fashion? Patterned undercuts are in and the only limit is your imagination. Here the undercut has been cut in a diamond style pattern while the upper locks were straightened and swept to the back. 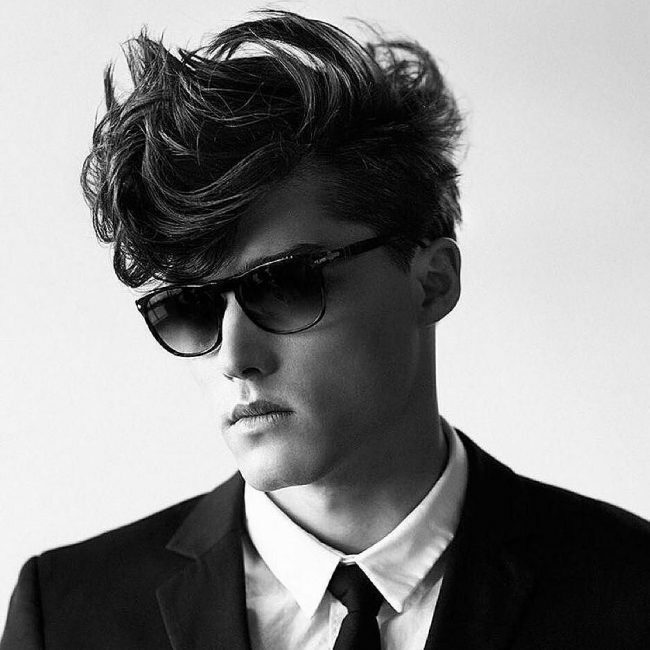 Dapper looks are all about being neat and having a tidy hairstyle. 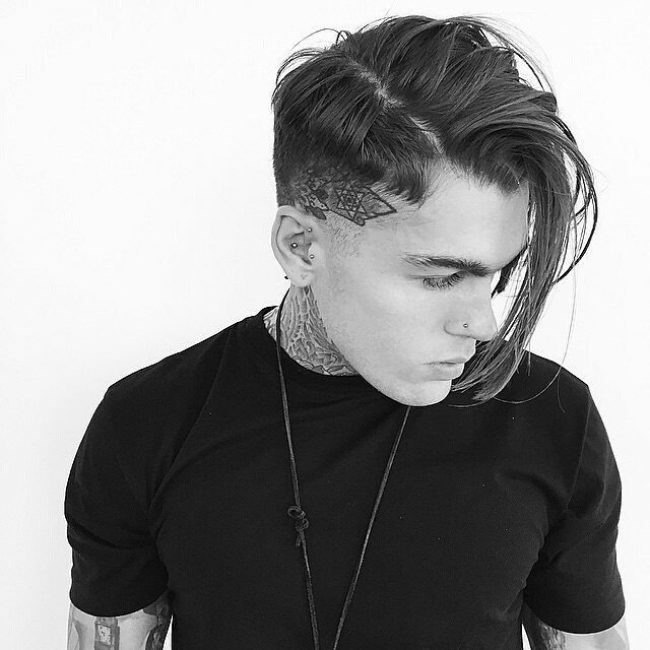 In this example, the undercut has been professionally faded out from top to bottom and the longer top locks have been slicked back. True dapper looks like this work best with no partings or hard lines. 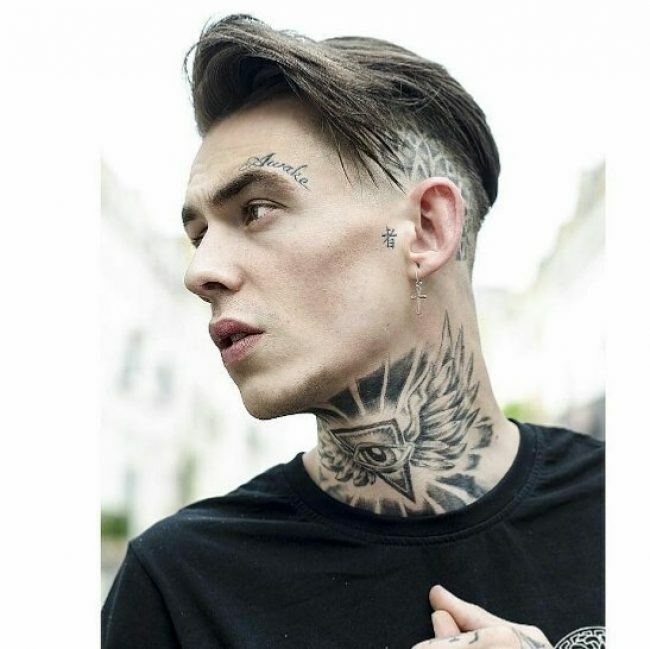 Long wavy hair can look untidy, so why not add a skin fade to keep it current? 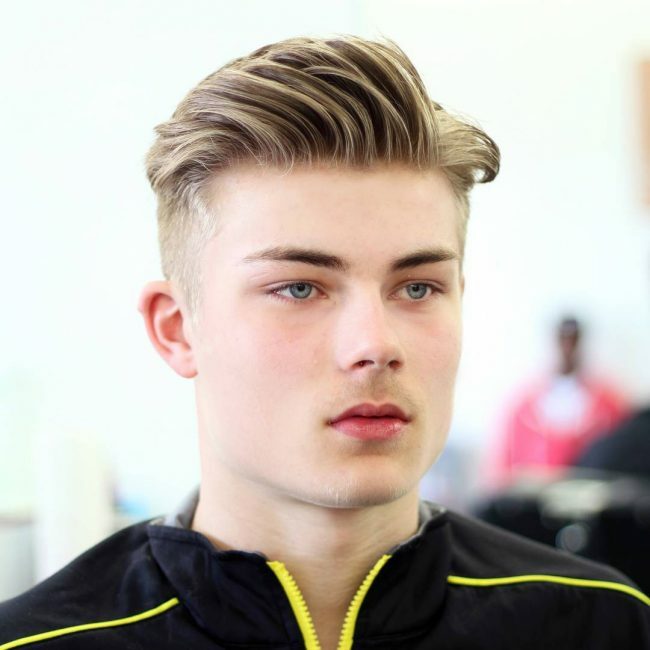 Here alongside a high parting clippers were used to create a gentle fade to one side while the length of the hair has been retained on the other – perfect to show off well- maintained medium length hair. Don’t follow the herd – create your own unique style and wear it proudly! In this singular hairstyle a short off center parting curves around before melting into the crown. To both sides, we can see chunky cut hair with a short fade over the right side. To spice up the quiff a trendy gray color was used. In this example, the parting line has been taken diagonally back across the crown as opposed to straight back. 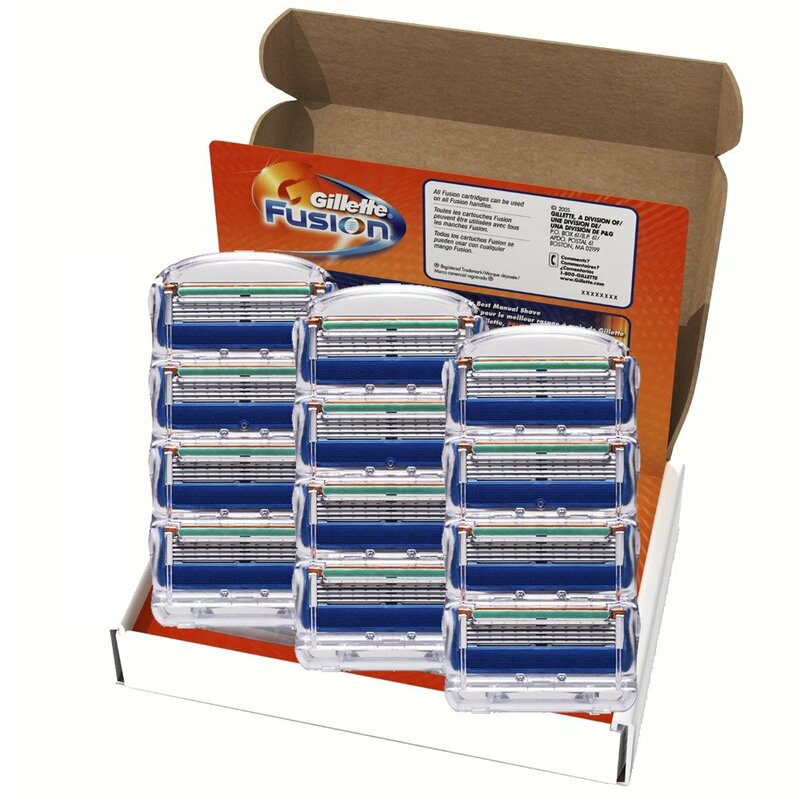 This helps you have more volume on the parted side and balances the hairstyle. This look incorporates both sharp lines and rounded ones, creating a style that demands a second look. There is plenty of volume in the curly top locks and it is offset perfectly against the gentle fade out on the side. Here a curved step cut sweeps into a V-shape at the back and the top hair has been highly texturized. In front, we can see a disconnected side comb over which draws attention to the stark undercut. This is an edgy look with a punk-inspired feel. 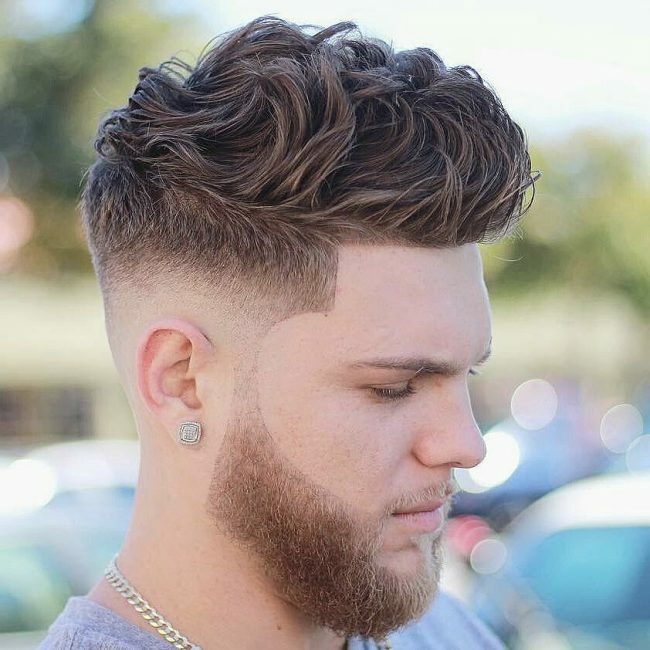 In this look, both sides have been trimmed into a skin fade beneath the high, defined partings. The upper locks have been blow-dried and swept over the face, creating a cheeky curl that falls on the brow. Volume in the front of a hairstyle like this works well to add length to square faces. In this bird’s eye view, we can clearly see the hard partings that define this hairstyle and how a stepped layer has been created in the undercut. The top locks have been combed back and to the sides providing lift over the forehead - a la pompadour. In this picture, the hair has been snipped into a V-shaped style with a graded undercut. The top locks taper off into a step and to style the locks have been swept together at the back. Pompadour hairstyles don’t always need to be slick – try a modern twist by adding texture to top strands like this. This provides added interest and height to your gentlemanly look. Rounded off quiff styles like this are terrific for men of any age. It’s made modern by fading out the undercut and adding a hard parting. The hair was blow-dried and styled into a coif that’s as neat as a pin. This masterful undercut fades out wonderfully and is so tapered you barely notice the transition. On the other side, the long hair has been blow-dried and finger combed up to create a center flair. 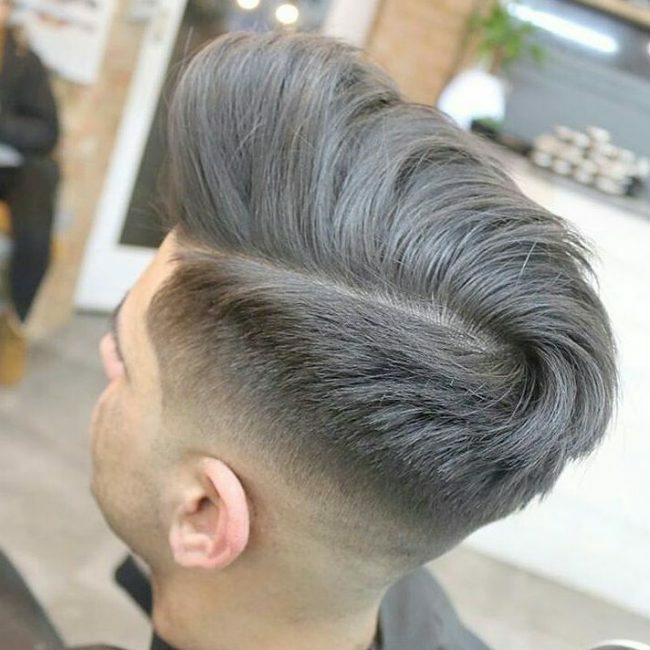 Quiff hairstyles are big again – this is a type of hairstyle that mixes the flattop and pompadour styles of the 1950’s and sometimes even blends mohawk elements in as well. 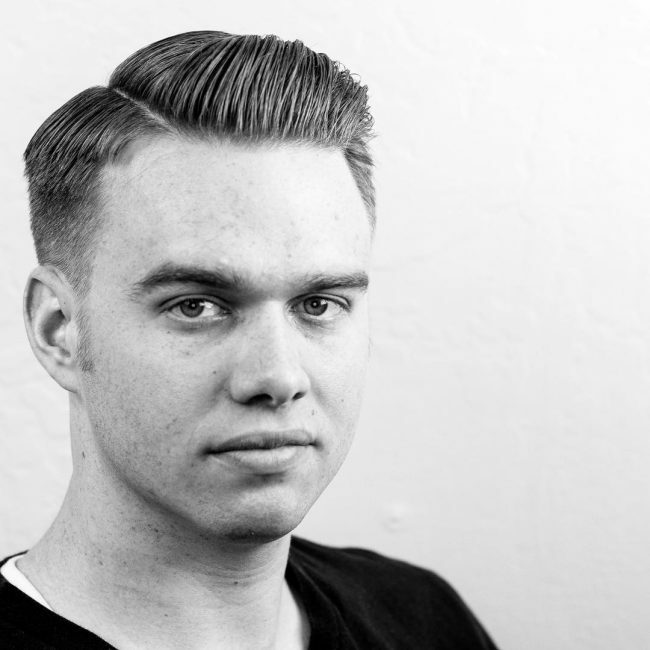 In the rockabilly style pictured here, the bulk of the hair’s volume is in front and is balanced by tight undercut sides and up and over front sections. Ready to show off your beach color hair? This style is being worn by hipsters everywhere! The undercut fades from the crown outwards instead of from the side down and the longer hair is worn forward rather than to the side. Draw attention to the shapely lines of your hairstyle by adding some razor line detail over the temples. 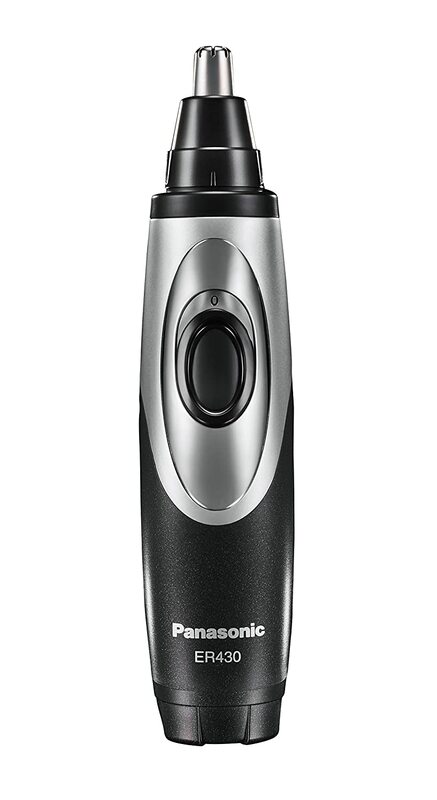 In this example, the sharp angular lines highlight the super straight hard parting and the precise skin fade. In this comb-over look, there’s not a stray hair to be seen! Platinum colored hair looks great when texturized and in this look the volume on top is emphasized further by darkly shaded roots. This dark color becomes more visible as the hair blends shorter along the sides. In this hairstyle, most of the locks above the undercut have been swept to the back while one section has been styled into an up and over curl that falls to the temple. Starting on the right side we see the hair styled to push up and gradually taper backward. Just before the hard parting, the hair has been braided back and on the other side, there is a skillful razor fade. 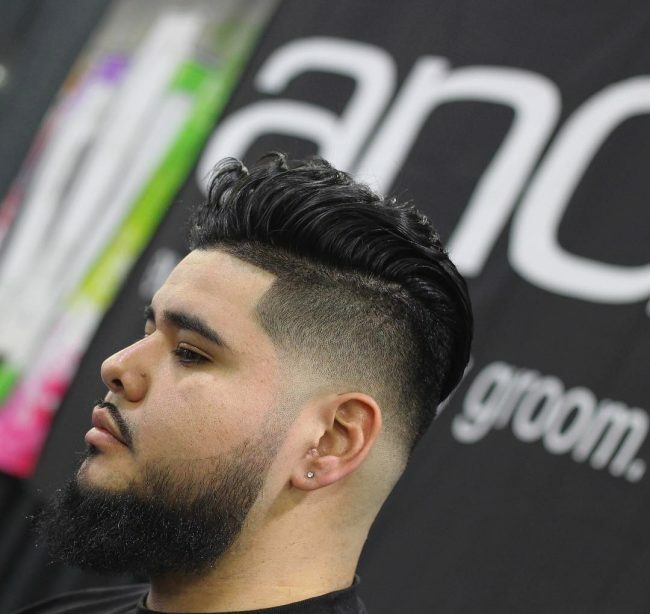 Chunky locks as seen here look even better when worn with a sleek tapered fade as contrast. 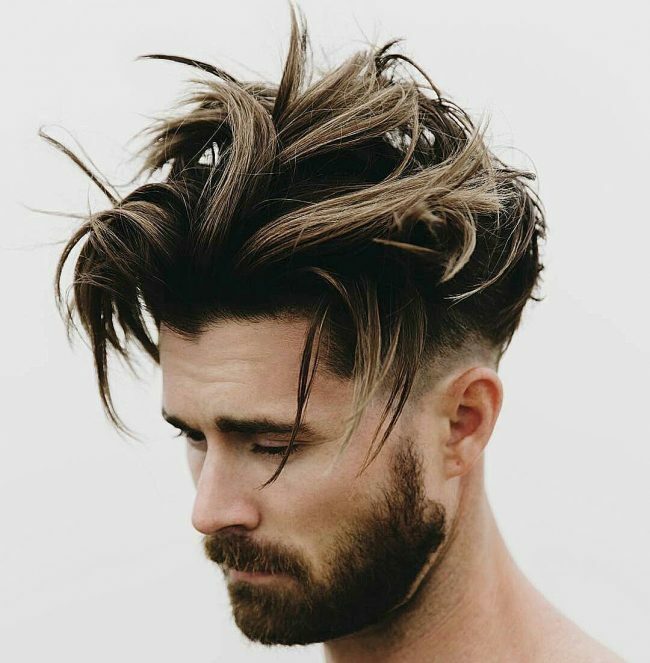 This hairstyle is neat at the back and textured on top with disconnected edges that brush the temple. The quiff is the comb over for gents wanting to rock a vintage look. 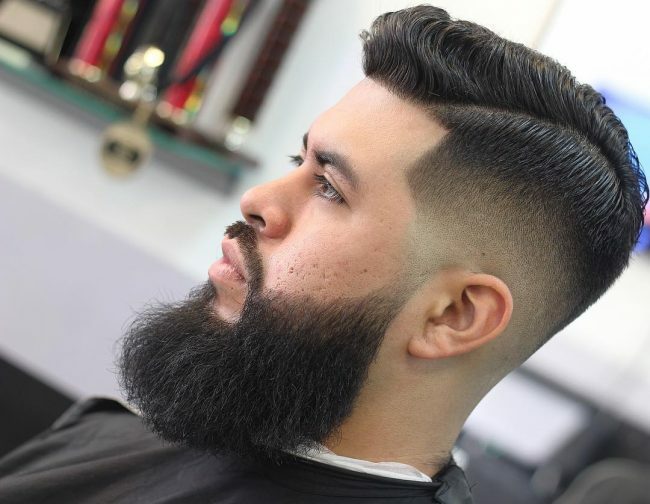 We love the weaving lines and thick waves of the upper hair and the gentle slope of the razor fade along the sides. 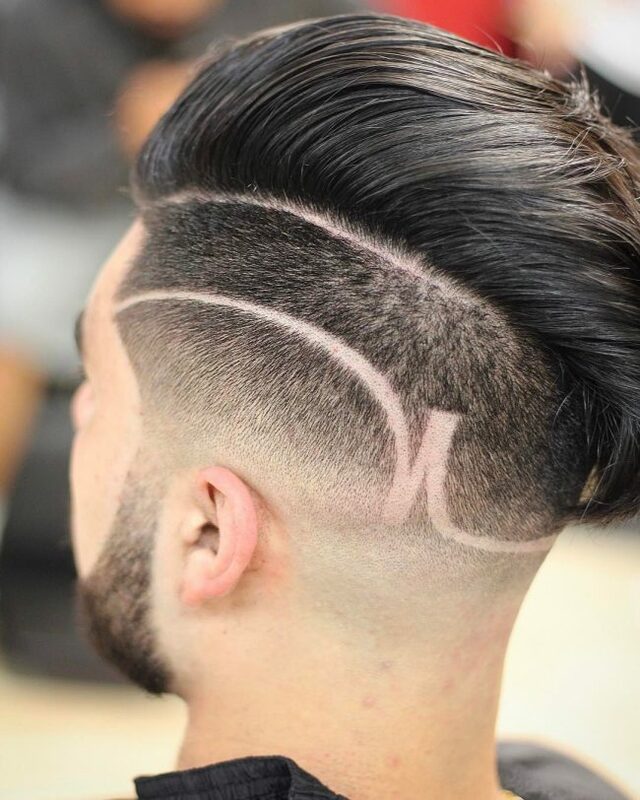 These locks have been given a razor fade undercut on the sides and choppy layers on the upper section. The hair is worn brushed forward from the crown and the stylist has added an interesting diagonal fringe. For this Mohawk inspired hairstyle, the undercut has been started high on the head and tapers the hair into a V-shape at the back. The long locks have been styled into a smooth fin shape that stands high while the sides have added pattern details. Underneath a high, straight parting the hair has been gradually clipped shorter in a neat skin fade and wraps around the head in a V-shape. The hair on the other side has been styled into natural looking waves that reach upward. Attention is drawn to this hairstyle by the diagonal line created by the overhanging top locks at the back. Underneath the edge of these locks, you can see a discreet V-shaped pattern in the undercut. Take advantage of naturally wavy hair to create a retro style like this! 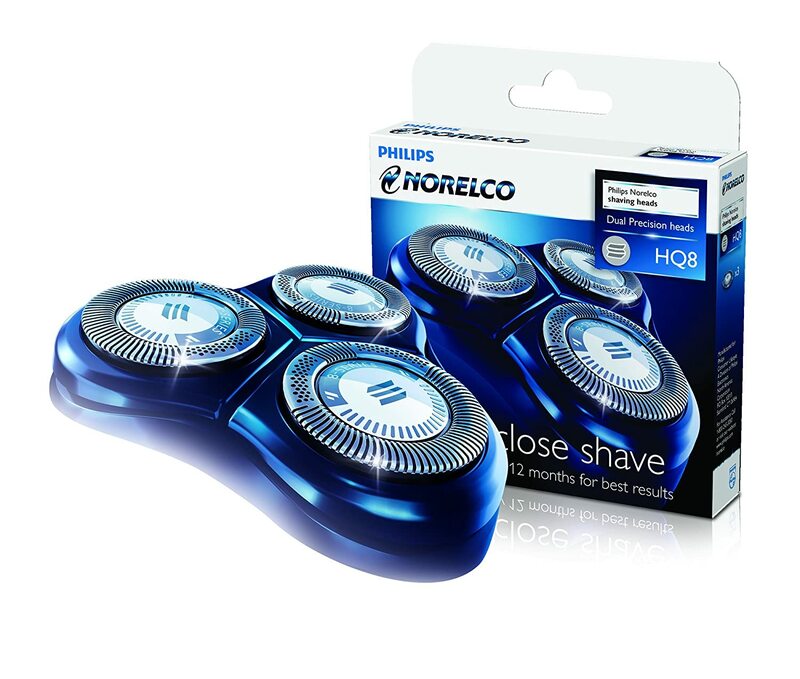 Pair with sharp details, a smooth razor fade and a twist over mustache and you’ll be soon be turning heads. For men with a musical soul mainstream haircuts just won’t cut it. That’s why they turn to asymmetrical hairstyles like this, which incorporates the quiff element together with a gradual fade out. Go for Hollywood glamor and copy this handsome hairdo! Here the undercut is slightly choppy while the upper locks have been blow-dried and finger combed up, out and slightly forward. This hairstyle is well balanced and the curly texture on top helps soften the angles of his face. 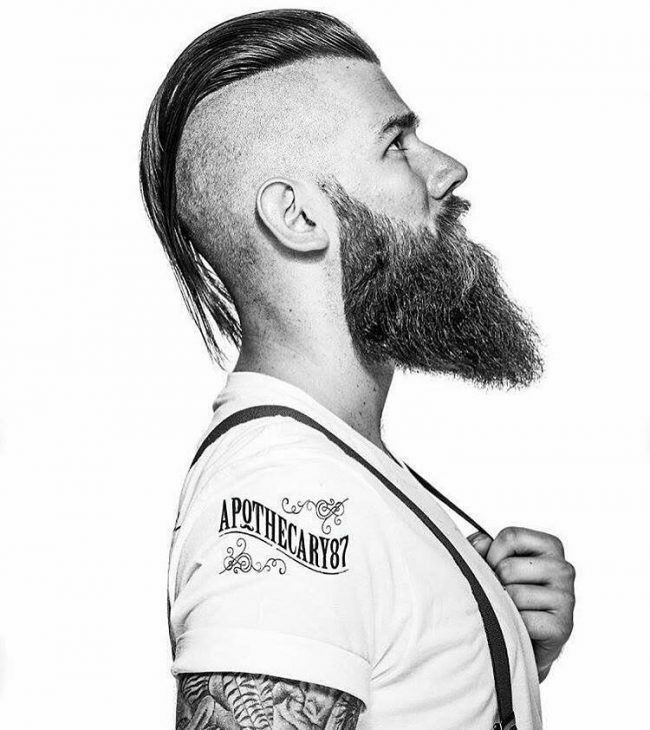 The sides have been neatly trimmed into a layered undercut and provide the perfect contrast for the upper locks. 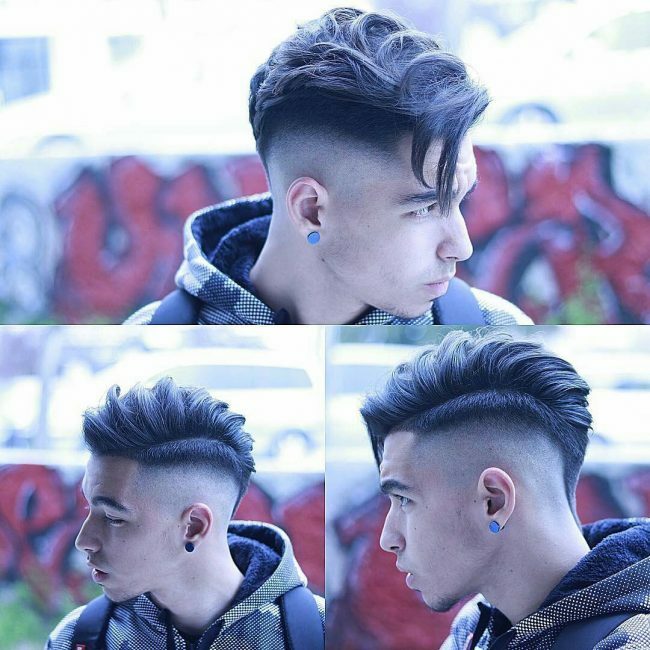 There is an undercut for every guy and frankly, when it looks as neat and trendy as the hair in these pictures which guy wouldn’t want it? Stay on style by adding a quiff or a tight comb over – whatever suits you best and you’ll soon be the talk of the town!